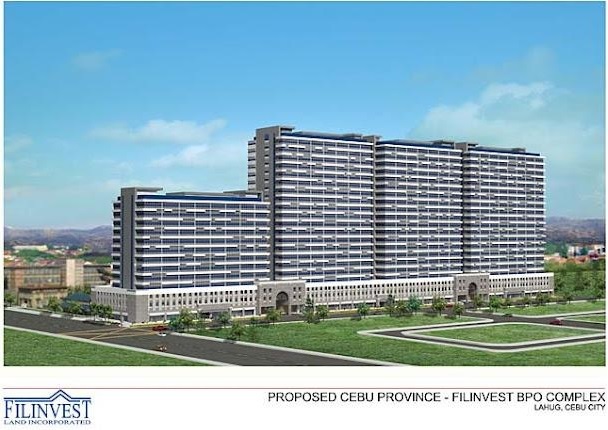 In a major move to expand its BPO presence outside of Metro Manila, FLI enters into a joint venture project with the Province of Cebu for its 1.2-hectare property along Salinas Drive, Lahug, Cebu City under a Build-Transfer-Operate (BTO) scheme. Under the BTO Agreement, FLI shall develop, construct and operate the BPO Complex. FLI will operate and manage the facility for a period 25 years with renewal option for another 25 years upon mutual agreement of both parties. The company will construct the first building by the third quarter of 2012 and to be completed by 2013. With this first BPO office building project outside Metro Manila, FLI is targeting to expand its presence further in other urban areas. The entire project would be developed over a 5 year schedule with estimated total investment cost of Php 6.0 Billion. It is expected to generate about 15,000 to 20,000 jobs for the Cebuanos. Filinvest has extensive experience in developing a BPO complex, being one of the pioneering companies engaged in IT-BPO projects in the Philippines. It constructed its first IT-BPO campus, the Northgate Cyberzone, in Filinvest Corporate City Alabang, Muntinlupa City. Thus, it became the leader in developing offices with infrastructure to support IT-related and BPO businesses in the growing southern Metro Manila area.